Birds of all kinds perch on the generous branches of the Tree of Life. Surrounded by crimson blossoms, the feathered songsters join in a joyous celebration of nature. 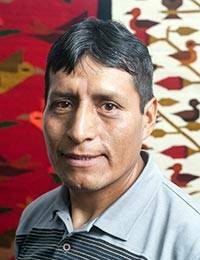 Working on a traditional Andean handloom, master weaver Eliazar Ochoa transforms virgin wool into a splendid wall hanging.